I’d heard about this guy for a while. Turns out the “Wildman,” a.k.a. Steve Brill, looks pretty normal, more like your high-school biology professor (albeit one who wears a pith helmet) than Crocodile Dundee. 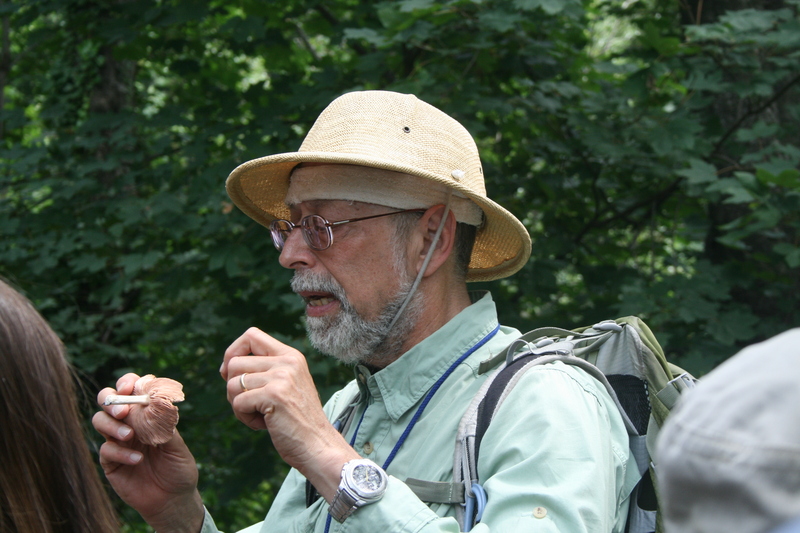 Brill has spent the last 30 years tasting his way through parks and preserves in the northeast, cataloging edible plants and fungi, and teaching others to do the same. This past Saturday, I was pretty frantic with joy to discover he was leading a group on a trek in Brooklyn’s Prospect Park, a stone’s throw from my house. I hold a dim childhood memory of mushroom hunting with my Grandma Frietchen, and I recall she was very, very good at finding morels. Of course, I regret I didn’t pay more attention or ask her about it later. It’s a skill I’d love to have now. Instead, I fumble with my little Audubon books, trying to tell the difference between a hen-of-the-woods and a polypore. Sadly, it wasn’t wet enough to find many mushrooms, but Brill found plenty of wild greens, spices and medicinal plants, growing alongside the joggers and cyclists in the park. The name of this fungus said it all: Stinkhorn. They are a pretty color, but appeal only to flies. Yuck. One of the best known edible wild greens, lamb’s quarters can be found here, or at NYC farmer’s markets for about $12 per pound. Another widely known green you’ll sometimes see in gourmet shops, we found purslane next to a path in the park. Very delicious, juicy and crunchy. Three leaves…middle leaf has the stem. You better know what this one is. Better have jewelweed handy. Often found growing near poison ivy, jewelweed is its natural antidote. Break the stem and rub the sap on exposed skin. It works on bug bites too and has a cooling feel on the skin. Lady’s thumb is everywhere in Prospect Park. Brill says adults don’t find the edible leaves very tasty, but toddlers love it. Lovely red berries from the hawthorn tree taste a bit like tiny apples. The older leaves don’t taste great, but small goutweed leaves are tender and tasty. Garlic mustard seeds are delicious and spicy. Rub them from dead plants that have gone to seed. Check Brill’s website for tour dates and locations. Wear pants and closed shoes unless you’re immune to poison ivy. Bring plastic bags and containers for pickings; a trowel and gloves are handy. A camera and a small notebook will help you keep track of what you’ve seen. If you’re ready for more than just a four-hour tour, Brill’s book, “Identifying and Harvesting Edible and Medicinal Plants in the Wild“, app and website offer deeper info and recipes. This entry was posted in Food, Green, People and tagged foraging, nature, plants, Steve Brill. Bookmark the permalink.